Karl Freiherr vom Stein zum Altenstein came originally from the area around Ansbach and studied law, philosophy and natural sciences in Erlangen, Göttingen and Jena. 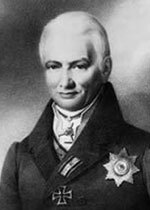 As an employee of August von Hardenberg he was involved in the founding of the state of Prussia. He became head of the Prussian ministry of culture in 1818. During his time in office, the University of Bonn was founded and schooling was made compulsory in the entire kingdom. He also oversaw the establishment of a curriculum at secondary schools. Along with Friedrich Wilhelm II, the King of Prussia, he established the national Protestant church of Prussia.